Wildlife in Chernobyl: Debate over mutations and populations of plants and animals in the radioactive fallout exclusion zone. Do Animals in Chernobyl’s Fallout Zone Glow? The scientific debate about Europe’s unlikeliest wildlife sanctuary. 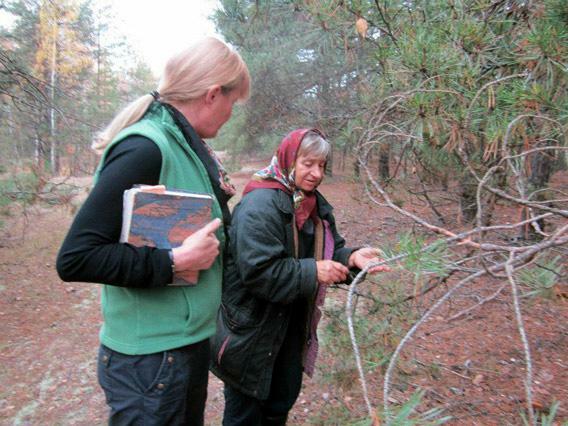 In the Chernobyl exclusion zone, Valentina Sachepok (right) points out herbs to author Mary Mycio. See a gallery of Chernobyl’s wildlife here. Valentina Sachepok darted ahead while I chased her through a forest in the exclusion zone surrounding the Chernobyl nuclear power plant. A camera crew followed us; they were shooting a documentary about the babushkas of Chernobyl. The 1986 disaster forced the permanent evacuation of 300,000 people, but a smattering of women still live semi-legally in their old homes. Sachepok, a retired nurse in her 60s with tufts of gray hair peering from under a maroon kerchief, didn’t walk but trotted, sprinting abruptly while the rest of us scrambled to keep up. After collecting fat yellow mushrooms from a clump of moss, she led me to a pine tree. “This one is for the hedgehog,” she said of the spiny creature beloved in Slavic folktales. She pierced a mushroom on a pine branch close to the ground. That’s where radioactivity is highest these days. The explosion and fire here spewed the equivalent of at least 20 Hiroshima bombs’ worth of radiation, mostly within about 25 miles of the reactor building. The most radioactive isotopes have long since decayed, and rain has washed the rest into the soil and the food chain. Two of the most persistent isotopes are cesium-137, which chemically mimics potassium, and strontium-90, which imitates calcium in living things. As these isotopes have been taken up by plants, animals, fungi, and bacteria, radioactivity is no longer on the zone, but of it. This is a unique ecosystem, twice the size of Rhode Island and about evenly divided between Belarus and Ukraine. A generation after most humans abandoned the area, forests and wetlands have consumed once-tended fields, villages, and towns. Only the occasional carcasses of crumbling buildings mutely testify to the former occupants. Sachepok stuck another mushroom a foot higher on the tree. “That’s for the roe deer. It’s hard for them to find food under the snow.” The late October day was still warm, but Ukraine’s winters are frigid. Few wild animals lived in the region in 1986; their habitats had been destroyed for Soviet dairy farms and pine plantations. But large mammals started appearing almost immediately after the evacuations, and the animal populations soon exploded. Roe deer and wild boar caught here in the early 1990s packed more than 2,000 times the safety norms for cesium-137 in meat. Though internal radiation levels have since dropped dramatically, some animals recently tested in Belarus still exceeded safe levels by dozens of times. But in a surprise to just about everyone, the animals all looked physically normal. The same was true of other species tested—radioactive but normal-looking. The few known exceptions include albino spots and some deformities in barn swallows. Of the dozen moose sightings I’ve had in my lifetime, all were in the exclusion zone, where in the course of many journeys I’ve spent more than a month’s time researching my book Wormwood Forest: A Natural History of Chernobyl. It’s a strange and beautiful place where I’ve spotted wolves in broad daylight; lynx tracks in the snow; and huge herds of boar, roe deer, and elk. I’m still drawn back. Sachepok smiled with more mischief than seemed possible for a lone woman in a radioactive no-man’s land. “The animals all know me,” she said, a gold tooth glinting, before lecturing me on healthy living, including avoiding what she called the “zombie box”—television. I think she meant it politically. Ukrainian TV is pure propaganda. But when it comes to Chernobyl, it is only a matter of time before zombies or mutants come up. Whenever I tell anyone about my encounters with Chernobyl wildlife, the questions are always the same: Do they have two heads? Do they glow? Do you glow? Actually, in the early years, when contaminated dust coated everything, researchers found countless examples of the monstrous mutations imagined in 1950s horror movies: malformations, dwarfism, gigantism, strange growths, and, yes, even some glowing. But those effects were seen only in plants. While Attack of the Giant Leaves doesn’t seem as horrible as the Creature With the Atom Brain, no one has ever found seriously deformed wild animals (or zombies) after the Chernobyl accident. Mutant animals born in the wild die or get eaten before they can be discovered. Whatever the biological costs of radiation to individuals, the fittest survived. Chernobyl’s abundant and surprisingly normal-looking wildlife has shaken up how biologists think about the environmental effects of radioactivity. The idea that the world’s biggest radioactive wasteland could become Europe’s largest wildlife sanctuary is completely counterintuitive for anyone raised on nuclear dystopias. The news isn’t good for all animals. Many species that like human company—swallows, white storks, pigeons—mostly left the region along with the people. Also, small creatures seem to be more vulnerable to the effects of radiation than large ones. That may be why Chernobyl rodents studied in the 1990s had shorter life spans and smaller litters than their counterparts outside the zone. Stag beetles had uneven horns. But it didn’t affect their population numbers. And because the health of wild animal species is usually judged by their numbers rather than the conditions of individuals, Chernobyl wildlife is considered healthy. According to all the population counts performed by Ukraine and Belarus over the past 27 years, there is enormous animal diversity and abundance. The prevailing scientific view of the exclusion zone has become that it is an unintentional wildlife sanctuary. This conclusion rests on the premise that radiation is less harmful to wildlife populations than we are. In an effort to challenge that view, biologists Timothy Mousseau of the University of South Carolina and Anders Moller of the University of Paris have published a series of papers claiming that populations of insects, birds, and mammals are declining in Chernobyl’s most contaminated regions. They also contend that birds avoid nesting in highly radioactive areas. They dismiss contrary reports of animal abundance as anecdotes. Their work has attracted media attention, especially after the Fukushima nuclear calamity in Japan, perhaps because it fits so well with the zombie/mutant meme. A phalanx of experts in environmental radioactivity have questioned Mousseau and Moller’s methods and conclusions, however, while the Ukrainian co-author who did the field work has repudiated their article claiming that birds avoid radioactive areas. He told Wired in 2011 that the experiments were never designed to test that hypothesis. One flaw in the scientists’ research is that they studied the most inappropriate place possible. Moller and Mousseau claim that the greatest negative effects on wildlife populations are in Chernobyl’s “most contaminated” places—using the plural, which suggests they tested a lot of them. While the Chernobyl exclusion zone contains many “very contaminated” territories, it contains five “most contaminated” patches, and they sampled only one, the Red Forest. A stand of pine trees that turned red when high radiation killed their chlorophyll, the Red Forest was buried on the spot and planted with pine saplings. It is one of the few places you can still find the plant deformities seen shortly after the disaster. The young trees are short and stunted, resembling crazy twisted bushes. It looks nothing like a natural pine forest. The birds that the Mousseau and Moller claim are avoiding radioactive areas are actually avoiding a really weird-looking habitat. It is hardly possible to pick a Chernobyl location guaranteed to have fewer animals. To then suggest that the low wildlife numbers in the Red Forest is representative of the remaining 99.098 percent of the zone’s territory is like claiming that animals are declining in Yellowstone National Park because you found few spiders in the parking lot. Deep in the zone’s interior, where the other “most contaminated” patches are and humans aren’t, is a restored swamp in Belarus where I once watched an amazing multitude of ducks, egrets, swans, and once-rare black storks rise in a raucous, squawking cloud, while a moose watched us from the other side of the road. Lake Hlyboke, by far the most radioactive waterway in the world, is another “most contaminated” place, where I spotted a black grouse, a flock of partridges, and three roe deer during an hour’s visit. A 2011 study found that species diversity is greater there than at any other Chernobyl lake. Mousseau conceded in an email that “it is quite possible for there to be more animals in the radioactive areas” outside the places he and Moller studied. But he told the New York Times that “Over all, it’s a myth to suggest that animal abundances are higher in the Chernobyl exclusion zones.” And over email, he went on to assert, as he has many times, that no one has ever gone out and actually counted the animals—even though Belarus conducted systematic animal studies from 2005 to 2007 and selective censuses since. Those studies found mammal diversity and abundance equal to that of a protected nature reserve, with rare species including bears, lynx, river otter, and badger as well as introduced herds of European bison and Przewalski’s horses. Bird diversity is even richer and includes 61 rare species. Whooper swans—never before reported in the region—now appear regularly. Mousseau says they’ve changed their research protocols in response to some of their critics, but so far he and Moller have not ventured out of the Red Forest to research deeper into the other “most contaminated” places in Chernobyl’s evacuated zone. It will be a shame for science if they don’t. They are among the very few Western scientists doing research here. Until they find more meaningful measures of radiation’s impact on wildlife abundance, their broad claims about declining animal populations really apply to just one highly unrepresentative location. The controversy ideally will spur better-designed studies, perhaps by critics. It’s about time for renewed interest in the impact of radiation on Chernobyl wildlife. More than a quarter-century has passed since that disaster. Fukushima showed us there will be more in the future. If we are to make smart energy choices, science needs to learn a lot more about the risks of chronic, low-level environmental radiation. We still don’t know how safe is really safe. Earth’s nuclear wastelands are natural laboratories for asking many of these questions. In the meantime, don’t worry. Chernobyl’s radioactive critters aren’t going anywhere—if we continue to leave them alone.